Below I have a screen grab of my After Effects workspace with the Blender Render view over it. In the Render view (on the left), the neuron scene looks correct (using Filmic). When the 16bit EXR is imported into After Effects the lights look very hot and blown out and the color has shifted (on the right). When using PNG, this doesn’t happen. Is there anything I can do to be able to use filmic with EXR in After effects and have it look the way it does in the Blender interface? I believe you may have to use ACES from opencolorio.org? Not sure though. When exr is saved, looks are not applied, so you miss the filmic part of it. It should be possible to apply filmic transforms using OCIO plugin in AE, but it is kind of messy. Search the forum for this, some explanations of how to do it should come up. Thanks…I tried installing all of that stuff in After effects and it just didn’t work. Also, the process in the video I watched was so convoluted there’s no way I’m doing all of that crap every time I import footage. I’ll save to PNG or TIFF…or not use Filmic. Why in 2019 are we dealing with BS like this? It should just work when it gets imported. It should just work when it gets imported. Contact the Adobe developers and let them know. Don’t use .png, save to 16 bit .tif. Better yet, if you can, would be to use something that handles colour correctly, such as Nuke or Fusion. Use a generally acknowledged color space and transforms if you want stuff to work in 2019. ACES for example. Oh, it doesn’t work out of the box either… and it is just about the widest used and most coherent color management system there is for film and animation. Color handling in AE is bad, just as it is bad in PS. 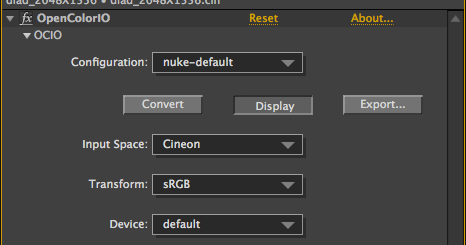 Use Nuke or Fusion or Natron if you want something less convoluted. Filmic conf works fine in Nuke if you know what you are doing (it doesn’t “just work” there either).